Back in 1999, American author Stephen Chbosky published the novel The Perks of Being a Wallflower. The book, which followed the character of Charlie as he navigates between the worlds of adolescences and adulthood and attempt to deal with poignant questions by those around him (friends and family), did receive commercial success in the literary world, though it was banned in some American schools for its content (i.e. sexuality and drug usage). In 2012, Chbosky’s directed his sophomore theatrical film (the first was 1995’s The Four Corners of Nowhere) and adapted his own book for the big screen in the movie The Perks of Being a Wallflower. The film, which starred Emma Watson, Logan Lerman, and Ezra Miller, was met with positive reviews from critics and moviegoers, sharing a modest success of profiting roughly $33 million against its $13 million production budget. Additionally, Chbosky has also acted in other moviemaking capacities for other feature films, including a producer for 2007’s The Poughkeepsie Tapes and writer for both 2005’s theatrical adaptation of the Broadway show Rent and Disney’s 2017 live-action adaptation of their classic Beauty and the Beast. Now, Lionsgate Studios (in association with Participant Media and Walden Media) prepare for Stephen Chbosky to return to the director’s chair with the film Wonder; based on the book by R.J. Palacio. Does the movie find its stride or does something get lost in its “page to screen” translation? Born with Treacher Collins syndrome, August “Auggie” Pullman (Jacob Tremblay) has endured several surgeries to help him live a semblance of a normal life. Although incredibly bright and sharing a lot of the same interests as ordinary kids his age, Auggie is well-aware of his physical facial appearance; enjoying hiding his disfigurement behind a toy astronaut helmet in both in public and in his own privacy. Homeschooled by his mom, Isabel (Julia Roberts) for years, Auggie makes the jump to a real school when he starts fifth grade, with Isabel and her husband Nate (Owen Wilson) there to support their son, but are a bit concerned over letting their son attend public school (fearing the ridicule that Auggie might face by his fellow peers). Immediately, after being targeted by classmate bully Julian ( Bryce Gheisar), Auggie manages to strike up a friendship with fellow students Jack (Noah Jupe) and Summer (Millie Davis). Meanwhile, Auggie’s sister, Olivia (Izabella Vidovic), is going through changes of her own, facing the sudden loss of her tight friendship with her bestie Miranda (Danielle Rose Russell), the blossoming the romance with fellow classmate Justin (Nadji Jeter), and feeling the somewhat neglected loving support from her parents, who’s attentions are drawn to Auggie. Together, the Pullman family works to find way to preserve and show others that it doesn’t matter how you look like on the outside, but what lies within your heart that matters the most. Working at a bookstore, I do remember seeing Chbosky’s The Perks of Being a Wallflower book many times (i.e. picking it up for customers and / or restock copies of the book back onto the shelves), but I never “officially” read the book. However, people have told me about the book and how good it is, especially with the title being listed on several times on high school’s reading lists (despite the conversional subject matter that was mentioned above). That being said, I did see Chbosky’s 2012 film adaptation of The Perks of Being a Wallflower and I liked it, especially with the young cast (Watson, Miller, and Lerman). Additionally, I do remember seeing Chbosky’s name be mentioned as writer for 2017’s Beauty and the Beast (a film which I love). This brings me to my current review for the film Wonder; Stephen Chbosky’s newest film. In case you didn’t know, Wonder is based off of the children’s book of the same name by author R.J. Palacio. Since its released, the young reader’s book has become a bestselling novel, with many readers and literary critics praising Palacio’s story. Like Chbosky’s The Perks of Being a Wallflower, I knew of the book Wonder, but never officially read it (I do plan on reading it after seeing this movie). I remember seeing the trailer throughout the year and found it to be interesting (another reason for me to read the book) as it looked like a touching heart-warming tale with probably some thematic moral lessons to be learned. So, I took a chance and went to see the movie, hoping that my initial feeling about the film was right. What did think of it? Was I right. In fact, I was (and that’s a good thing). While the movie adaptation does falls into some conventions in its story progression and into familiar territory, Wonder is a touching tale of friendship and love, which is elevated by its source material and strong performances from its cast. Also, before I forget, as I haven’t read the book yet (as stated above), I can’t compare “apple to apples” from Palacio’s novel to Chbosky’s film on what was add, changed, or omitted. So, being a beloved bestseller young readers novel, Palacio’s Wonder was a prime choice to be adapted into feature film, with Chbosky getting the chance to helming the feature. Given his background in the material of The Perks of Being a Wallflower (both the book and the film), Chbosky seems like the perfect choice in directing Wonder, navigating through Palacio’s source material and crafting a feature film that’s as heartfelt as it is poignant. To his credit, Chbosky does extremely well in bringing this beloved children’s book to life. Although I never read the book, one can simply tell that the film keeps the spirit of Palacio’s vision and intent, with Chbosky respecting the material and translating it to the feature-length film. In truth, the narrative of Wonder contains a powerful message that literally speak to everyone…. no matter the age, gender, or ethnicity. Just like Auggie, many of us (in sometime point in our lives) faced ridicule judgement and / or bullying from our fellow peers and felt like our world was going to crumble underneath these harsh criticisms / torments. I, too, have felt that pain, especially during one part of going to school and I think many of us feel the same way (be it being the bully, being bullied, or seeing others being bullied). However, Wonder’s message of choosing to overcome the obstacles, electing a person to perform acts of kindness, and not to “judge a book by its cover” mantra is something that is both uplifting and inspirational; a profound meaning that resonates strongly within the fundamentals of human behavior. And that’s the sprit that Chbosky keeps very much alive when directing this movie. In short, Wonder is terrific family film that has all the makings of a “feel good” movie, but it also has that such a profound message that speaks to all in such a positive and inspirational way. One of the most interesting aspects of Wonder was the fact that Chbosky creatively decided to spilt the film into sort of various “chapters that revolve around a different character. Yes, the character of Auggie is still very much the central protagonist of the story (and the film), but this unique approach showcases an interesting way for some of the film’s supporting characters (i.e. Jack, Olivia, and Olivia’s friend Miranda) to be given more characterization than just the standard side characters, with each one playing a role in Auggie’s life but also in their own paths. Chbosky juggles all these characters well, handling their transitions when the narrative is focused on them and never lingers on one for too long before returning back to Auggie, who acts as the main narrative thread of Wonder. Some could’ve had a bit more depth to them, but this style and their overall inclusion allows the film to stand on a level beyond than just common troupe of “following the main character”, with Chbosky given us (the viewers) different viewpoints in the story being told. Additionally, in terms of filmmaking presentation nuances, Wonder is presented in a favorable way. While most of the feature looks like your “standard” family drama film, its still solid piece from camera angles, to editing, to the musical score, to costumes, as well as a few fun Star Wars nuances and cameo appearances here and there, which are quite fun to see. There are a few problems that Wonder can’t overcome within its theatrical proceedings. First and foremost, the movie’ story (as a whole) is a bit formulaic, with the film’s writers (Chbosky, Steve Conrad, and Jack Thorne) treading down a very familiar path / territory when trying to rework Palacio’s novel. Thus, in terms of the nature of the beast, Wonder plays out in a somewhat predictable fashion, facing several trials and tribulations that have been played before. However, this was just a minor negative point. Conceding with that, the other problem in Wonder has that notion of manipulating feelings during certain scenes that draw out emotions. The movie never feels syrupy (i.e. like a Lifetime TV movie), but that are several parts in the film that the story loses its flow and are meant to drive home either generic plot points and / or emotional beats that do little to overall arching narrative of the feature. Again, this is more of a minor problem and doesn’t derail Wonder, but they do keep the film from reaching cinematic greatness. The cast in Wonder is another highlight point of the film, which is a mixture of recognizable faces as well as some unknown ones. Nevertheless, each one, whether a big or small role, gives strong performances that help elevate the feature’s presentation within both the story and their respective characters. Perhaps the best one of the group as to be Jacob Tremblay as the facial disfigured but kind-hearted protagonist Auggie Pullman. Known for his roles in Room, Before I Wake, and The Book of Henry, Tremblay proves once again how gifted he is as a young actor, adept in hitting all the right moments of comedic levity and drama / emotions. Thus, the character of Auggie Pullman is brought to life in such a sweet and endearing way, making Tremblay performance likeable and sympathetic right from the get-go. Even when the character of Auggie isn’t the main focus of the scene, Tremblay still displays some great acting, especially when interacting with his young co-stars as well as the adult stars. The rest of Wonder’s young cast do exceptional well, shining brightly in their respective roles, alongside Tremblay’s Auggie. Of the group, Izabela Vidovic (The Fosters and Homefront) gets the most screen-time as Auggie’s older sister Olivia “Via” Pullman, who goes through her own personal journey of isolated teen and caring sister. In truth, there was probably enough substance material to her character that there could’ve been a whole separate film made just for Via. Regardless, Vidovic does great as Via, showcasing a wide range of emotions and does have a well-rounded story arc than just a member of the Pullman family. Similarly, Danielle Rose Russell (Aloha and Pandemic), who plays Via’s estrange friend Miranda also has enough material to have been added to Via’s separate movie, with enough backstory to be awarded with a substantial sub-plot. It’s a shame that the movie doesn’t dig deep enough to give that backstory its proper due. Also, actor Nadji Jeter (The 5th Wave and Grown Ups), who plays Via’s fellow classmate / love interest Justin, is good in the role, but there isn’t much the character beyond what’s presented. The rest of the young cast is made up of Auggie’s classmates, including Noah Jupe (The Night Manager and Suburbicon) as the kind-hearted Jack Will, Millie Davis (The Best Man Holiday and Orphan Black) as the friendly Summer, and Bryce Gheisar (A Dog’s Purpose and Walk the Prank) as the bully Julian. Each one of the young actors present their best foot forward in their acting talents, making their characters great in their respective, especially Gheisar’s Julian, who many will truly loathe, which, in turn, makes for good acting skills. As for the adults in the movie, who are in supporting roles, actor Owen Wilson and actress Julia Roberts are the big ticketed stars of Wonder and bring their quality acting skills to the role as Auggie / Olivia’s parents Nate and Isabel. Wilson, known for his roles in Wedding Crashers, Cars, and Midnight in Paris, handles himself well, relying on his laid-back bravado and easy-going persona to make his character of Nate the “cool” dad with a sense of humor. Likewise, Roberts, known for her roles in Pretty Woman, Erin Brockovich, and Notting Hill, has a bit more juicer role than Wilson as Auggie’s mother Isabel. The character is a bit conventional, especially for this type of film, but that’s more about how the character was written rather than Robert’s performance. Still, both Wilson and Robert give a strong representation of being mom and dad Pullman. Rounding out the cast are actors Daveed Diggs (The Get Down and Black-ish) and Mandy Patinkin (Homeland and Criminal Minds) as faculty staff members of Auggie’s new school, with Diggs as Auggie’s teacher Mr. Browne and Patinkin as the school’s principal Mr. Tuschman. Both actors lend their weight in their supporting roles, delivering good-natured performances respectfully. 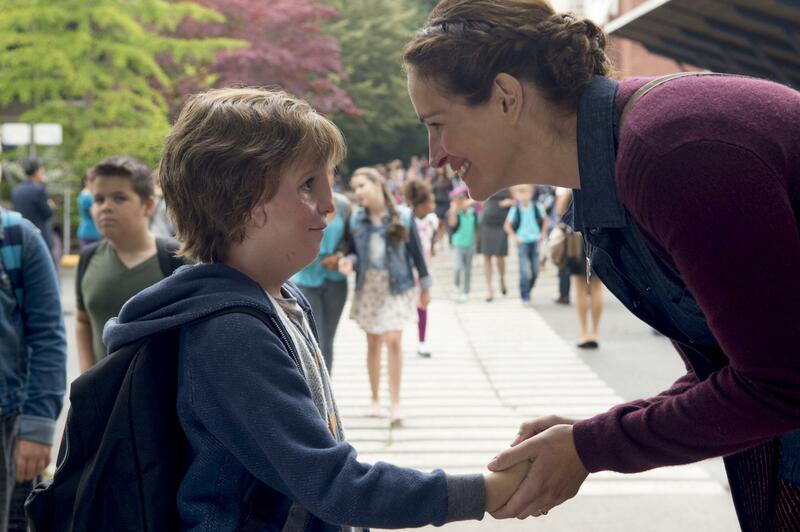 Auggie Pullman goes to public school for the first time and faces the trails of being “different” to everyone around him in the movie Wonder. Director Stephen Chbosky’s newest film brings R.J. Palacio’s young readers novel to life, offering up a good wholesome story of being different in the status quo and choosing to be better person (aka choosing kindness), While there are some areas in the movie that feels manipulative and does tread into familiar territory in both characters and / or storytelling elements, the movie stands as tall and proud as a perfect family friendly “feel good” feature, thanks to Chbosky’s direction, Palacio’s source material, and some solid performances from its cast. Personally, I liked this movie. It was a sweet and heartfelt movie that had a strong cast and told a very palpable message about “being different” and showing kindness to others. Thus, my recommendation for Wonder is a definite “highly recommended” as it something for everyone to see and hear, despite age, gender, or ethnicity. All in all, Wonder is touching “feel good” movie that will linger with you long after the movie is finished and echoes the fundamentals of kindness to others and to yourself. Just remember “When given the choice between being right or being kind, chose kind”. This is a really nice surprise. I was somewhat dismissive but it seems I should definitely give this a look. Great thoughts. Yeah, I was too. I was thinking it was just going to be another “page to screen” kid’s adaptation, but it actually pretty good feature that definitely has a very important message for everyone. Definitely recommend it to you. Thanks for reading and for the comment. You have convinced me. I will now give it a try. Good review! Oh wow….I did? That’s great to hear! Its definitely a crowd pleaser and a tried and true “feel good” movie.